Gerard Byrne, In Our Time, 2017, video, unfixed duration. Image courtesy the artist and Kerlin Gallery. 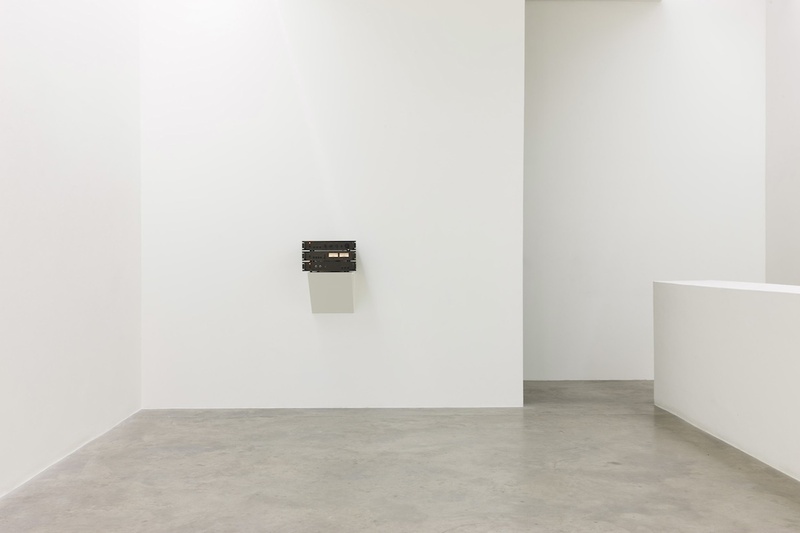 Gerard Byrne, In Our Time, Kerlin Gallery, 2 December 2017 – 20 January 2018. Image courtesy the artist and Kerlin Gallery. 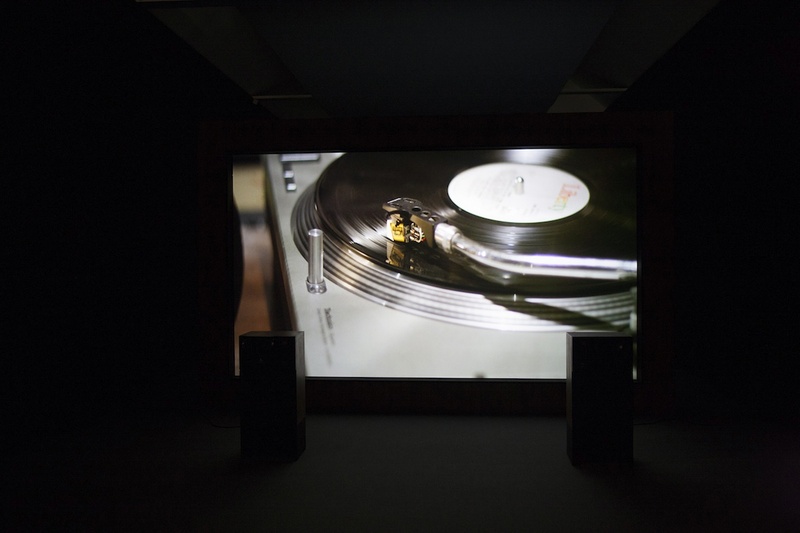 Gerard Byrne’s video In Our Time, a ‘period piece’ commissioned for Skulptur Projekte Münster and recently on show at the Kerlin Gallery, Dublin, depicts the human ecology of a radio broadcast. At some point in the recent past, a radio host plays a wide range of songs, presents weather, traffic updates, and advertisements, responds to a phone-in from a schoolgirl listener, and talks to a voiceless member of the studio staff. 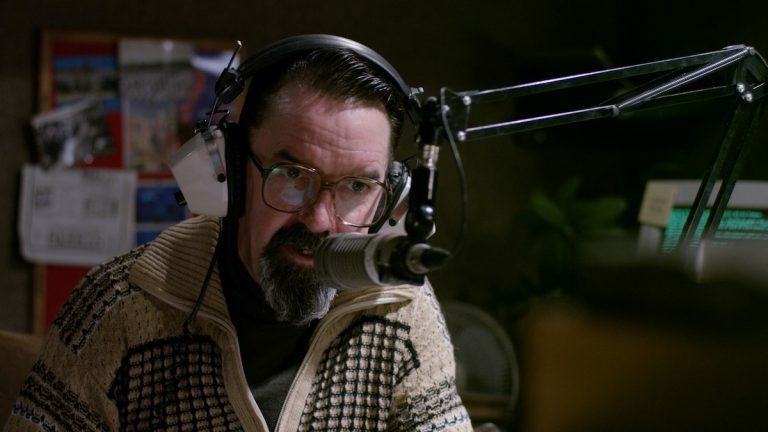 He provides a weather forecast for Interstates across the north-east and south-east quadrants of the United States, which knits meteorology, infrastructure, and public service with the same poetry as a BBC Radio 4 LW Shipping Forecast. 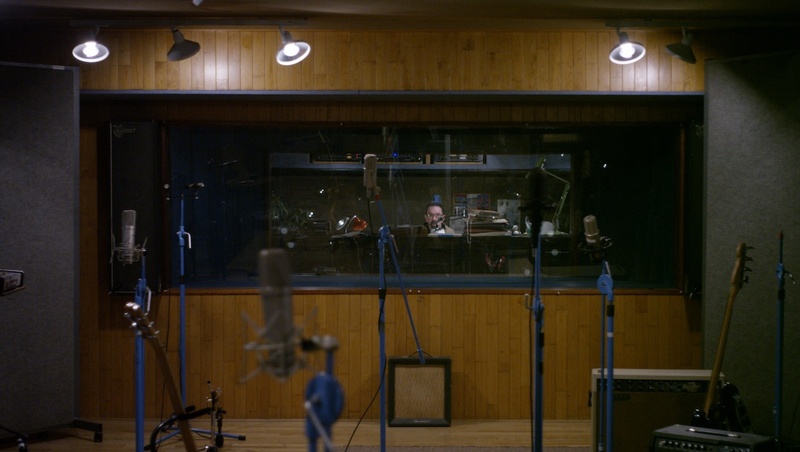 In the recording studio next door, four musicians chat and tune their instruments without purpose. 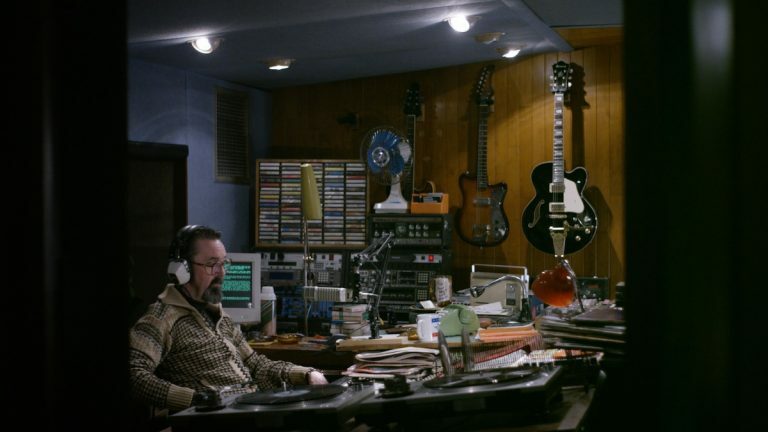 The camera pans slowly over these interiors, showing stacks of vinyl, light fittings, turntables, cassettes, microphones, coffee cups, the mixing desk, amplifiers. At first glance, In Our Time resembles a reconstruction. Some imagined golden age of the radio DJ, perhaps, an age of shared listening and youthful exuberance shaped by the rhythms of public broadcasting. But, most likely, this is a MacGuffin. There is little nostalgia here. For example, the radio host might be cheery, but his heart is not really in it. In fact, aside from his clichés that mark the time or introduce songs, his patter is a little queasy, most evidently when, responding to the schoolgirl’s phone-in request (her voice is slightly scrambled), he presses her for information on her new boyfriend. Something similar occurs in the sound design and installation. 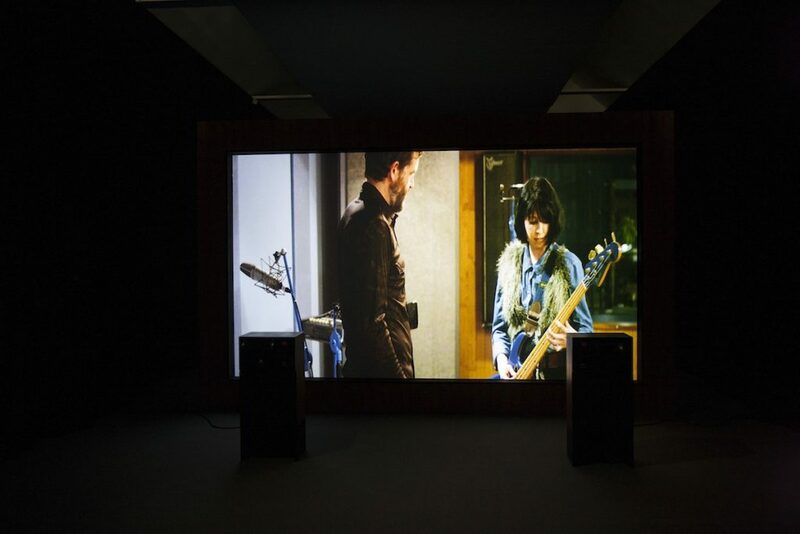 There are eight speakers in the gallery arranged in pairs back from the screen, which divides the black box. The front two, primarily, provide diegetic sound. The other six produce unidentified sounds oblique to the transmission. Outside, the other half of the Kerlin remains a white cube with a stereo set into the east wall through which all In Our Time’s sound is fed. The underbelly to this latter, conventional scene of listening is the other half of the black box, behind the screen. Byrne might present this as a Brechtian Verfremdungseffekt, where the apparatus is exposed, but it feels more like a Lynchian hinterland. Also, there are too many mismatches. The name of the station changes from one announcement to the next, and sometimes from the beginning of a sentence to the end. Songs played are not those announced. Period details, shot seamlessly, meticulously, are difficult to place in time. They are both precise and anachronistic. After twenty-five minutes or so, the sequence recommences. One of the musicians refolds her newspaper, the radio host again picks up his cup. He retells the news, but one detail snags, a punctum of sorts. He announces the time, which coincides exactly with clock time: 2.36pm in the studio is 2.36pm in the gallery. There is no melodrama here, no grandstanding of this uncanny diegesis. Recorded time coincides with clock time. The sequence is not a loop. The scenes and announcements repeat, except where the host announces the time, which continues to coincide with clock time. But the music selections change in a sequence that lasts, in effect, twenty-four hours. In Our Time, then, presents a “modular structure of indefinite duration” that thwarts our expectations of the video loop (e.g. arriving in the middle of the video, watching the final half waiting for the first half to begin again) and reproduces, in part, the rhythms and public intimacies of radio in the black box. In Our Time’s “tapestry-like structure” recurs at different scales. One might call it ornamental, as its interwoven modules encourage what Norma Broude called “a leisurely and less focused scanning for detail”, a varifocal attention particular to ornament and to radio. “Variatio delectat”, wrote Ernst Gombrich in The Sense of Order, his extensive work on the psychology of decorative art, published in 1979. Ornament allows us to probe for regularity “without making us lose the feeling of infinite and inexhaustible variety”. With In Our Time, one initially probes for regularity when trying to assign to each object its historical moment or, subsequently, to identify the extent of its loops. But, as noted, its features are difficult to place or decode and its exact structure is largely opaque. Again, In Our Time does not reconstruct or narrate a moment from the past. Byrne’s mise-en-scène is not historically inaccurate. How could it be? Nor is it precisely of its time. Instead, it offers varieties of keeping time, from the rhythm of songs to the practicing drummer to the announcements and jingles to the coincidence of clock time, lived time, and recorded time. The result is anachronic, rather than anachronistic. Anachrony describes how something belonging to a historical moment – a song, a jingle, a cardigan, a light fitting – is present at another moment. Whereas the anachronistic artefact depends for its conceptualisation upon a secure understanding of the historicity of forms, that they always belong to their time, an anachronic artefact reaches beyond the moment of its manufacture, performance, or broadcast. This enables it to make history rather than merely belong to it. The structure of In Our Time is such that it includes multiple temporal sequences in the same time. For Jacques Rancière, this is “the condition of historical activity”. In Our Time shows radio as a historical activity. Tim Stott is Lecturer in Art History and Visual Culture at Dublin Institute of Technology, where he coordinates the Creative Arts Masters Platform.